I love the New York Times. Really, I do. Not only is it the world’s leading newspaper, it speaks my language–the language of liberals. As much as it might not want to admit this, it does. However, I’m sometimes miffed by their reviews. They often miss the mark. For a paper as erudite as this one, it seems, their reviewers should “get” whatever they’re reviewing. Case in point: Taylor Swift’s latest album Red. In a piece titled, “No More Kid Stuff for Taylor Swift,” Jon Caramanica (an expert on pop music, perhaps?) provides a glimpse into what he believes Red is all about. He erroneously begins the review by stating that Taylor’s sole two subjects are love and heartbreak. Has he not heard “Eyes Open” or “Ronan”? Surely, a New York Times reviewer would do their research prior to stating “facts” all over the place. But, no, not Caramanica. Strike number one against his piece. To frame his perspective that he’ll later support, he states, “Her growth is largely musical, not experiential.” Here’s where I mostly disagree with Caramanica. What’s strange about his review is that he actually cites lyrics from Red that support the opposite of his thesis. For example, he picks up on the mini-conversation Taylor has with herself during “We Are Never Ever Getting Back Together.” I believe this aside reveals Taylor’s true sense of humor, which, in turn, shows her evolution from serious country star to someone who’s willing to laugh at herself–an adult trait. Carmanica says, “There is something different in Ms. Swift’s voice here: it’s serious and deep, and also shrewd. She has been through this before. She sounds like an adult.” Right, she sounds like an adult–so how does this prove that her growth is solely musical, not experiential? Caramanica also cites “I Knew You Were Trouble” as misplaced evidence of his own thesis. Instead of proving that it’s just the music that has evolved, he pins Taylor as someone who has pointed the finger at herself as the “culpable” agent in the rocky relationship she sings about. Isn’t that something an adult would do? Isn’t this self-implication unique to Red? I think so. Providing insight into previously uncharted territory for Taylor, Caramanica discusses Taylor’s foray into the sensual experience of love. How does this not show her evolution has been experiential? “On ‘Treacherous,’ written with the pop savant Dan Wilson, she sighs, ‘I’ll do anything you say if you say it with your hands,'” he writes. How you took the money and your dignity and got the hell out. ‘Cause now my name is up in lights, but I think you got it right. These lyrics signal to the reader that Taylor has had a revelation about her celebrity. 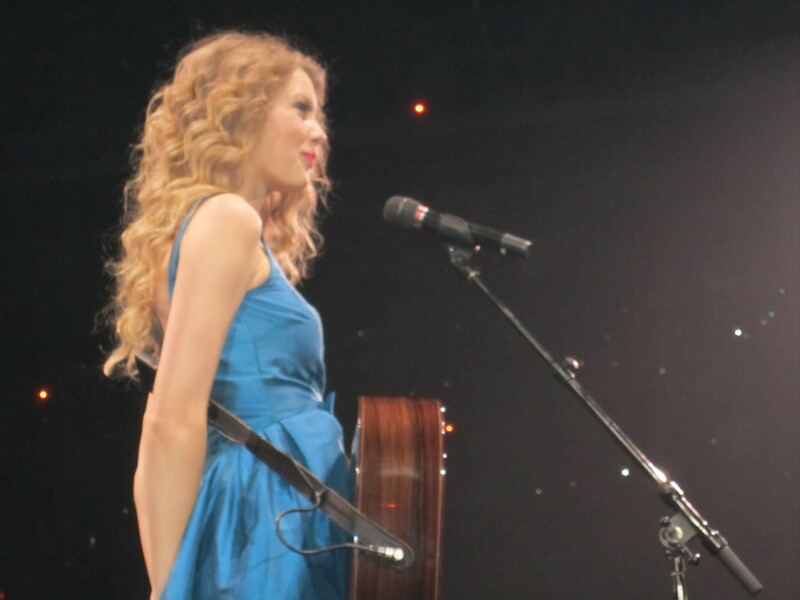 “Yeah, they tell you now you’re the lucky one,” she sings, about herself. She is the lucky one, and she knows it, but uses the story of the ex-celebrity as a cautionary tale for herself and her own trajectory. If this doesn’t show “experiential” maturity, I’m not sure what does. And the fact that Taylor, a seasoned songwriter in her own right who has had 50 Billboard Top 100 hits, made the adult move to collaborate with her “dream” industry songwriters and producers proves she doesn’t need to take full credit for her songs–an egoless decision and something not many songwriters who have had the success Taylor has had would dare do. An element of Caramanica’s review that I enjoyed was his observation that country cannot define Taylor and that she’s driving her own terms in the pop arena. “That’s because Ms. Swift is post-gatekeeper: country radio no longer gets to define her, and pop radio has accepted her novel terms,” he writes. I believe this is true, and I appreciate his pointing it out. Taylor Swift has had an unparalleled career–from country darling to pop sensation, she’s struck out with her own style and flair in every album she’s put together. I also agree when Caramanica writes, “Almost everything here is corroded in some way.” From the musical to the lyrical, Red is filled with less-joyful innuendo than her previous albums. And, Carmanica’s summary of Taylor Swift’s evolution is apt: “Ms. Swift has come a long way from ‘You Belong With Me,’ one of her biggest hits, in which she was the outsider throwing barbs at the more conventional, pretty, popular girl. ‘I’m listening to the kind of music she doesn’t like,’ she sang, wearing her individuality as a badge of pride. But now that other girl, she listens to Taylor Swift. She might even be Taylor Swift.” It’s true. So, New York Times–you kinda, sorta didn’t get at the heart of Red, but part of what you said was spot on. Hurricane Sandy – How Lucky Am I?